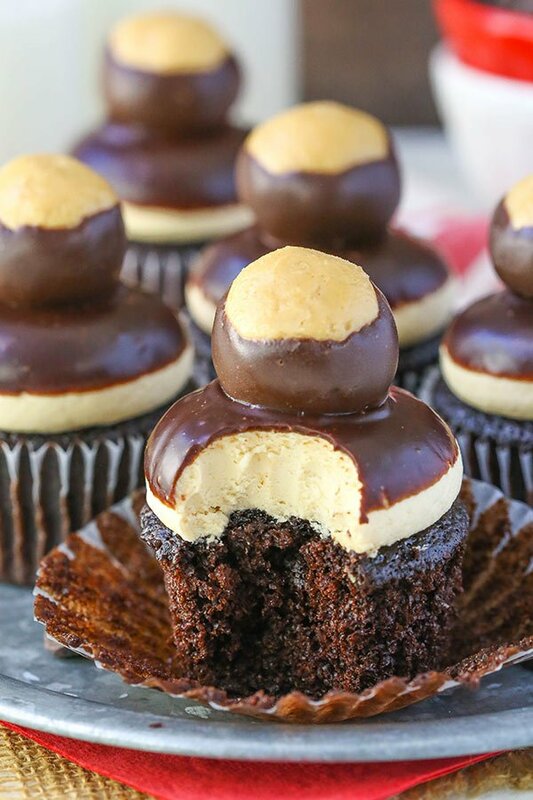 These Peanut Butter Chocolate Buckeye Cupcakes are made with a moist chocolate cupcake recipe, peanut butter frosting and chocolate ganache – all topped with a cute little buckeye treat! 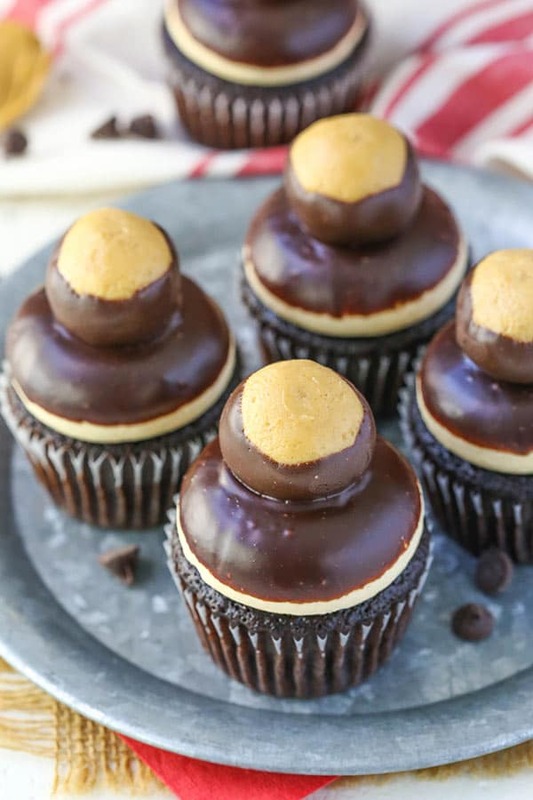 Perfect for the chocolate and peanut butter fans out there! There’s so much to love about these cupcakes. They are basically two treats in one, which is never a bad thing. 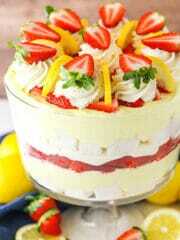 It ensures that your sweet tooth is most definitely satisfied when you’re done. Not to mention the peanut butter and chocolate combo. I’m pretty sure it’s like the number one most loved combo and these cupcakes are rich in both flavors. It’s a cupcake that will definitely not leave you hanging. To make them, you’ll first want to put together the buckeyes. 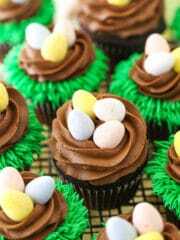 They are super simple to make, though the rolling of the balls and dipping in chocolate does add a touch of time to whole process of completing the cupcakes. 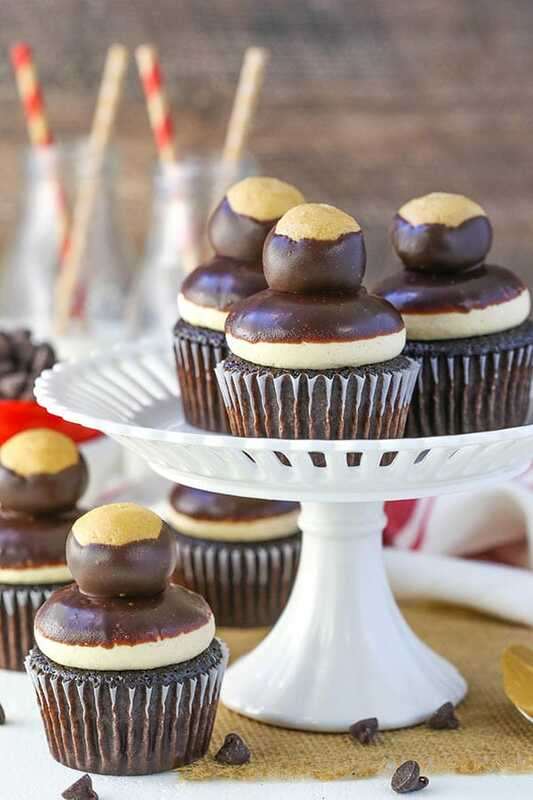 The buckeyes are made with peanut butter, butter, powdered sugar and a little vanilla extract. 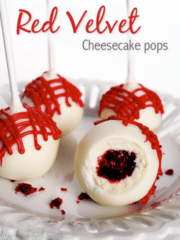 Roll them into balls and dip them in chocolate and try not to eat them all in process! Next up is the chocolate cupcake. I used my very favorite Homemade Chocolate Cupcakes for these. They really are the best cupcake ever. SO moist! 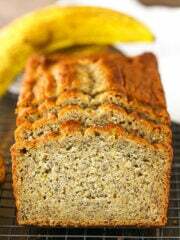 Don’t be alarmed at the thin batter and lower temperature setting – it’s all correct. To top the cupcake, there’s the peanut butter frosting. 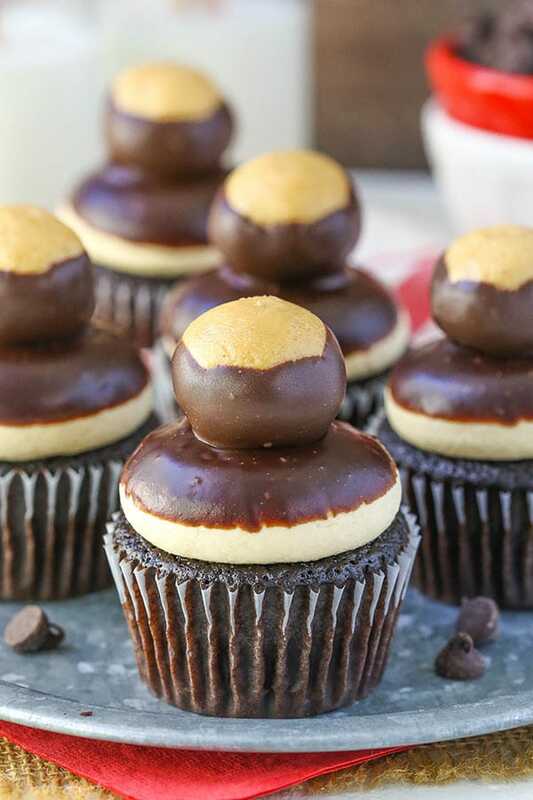 With many of the same ingredients as buckeyes themselves, you could argue it’s like topping a cupcake with more buckeye candy. Score! The frosting is made with butter and peanut butter that are combined until smooth. Next is the powdered sugar for sweetness and volume, and vanilla extract for flavor. 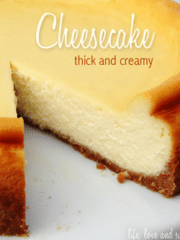 To help thin out the frosting and get a nice consistency, you’ll add some milk or water. Don’t dismiss the importance of the water/milk. 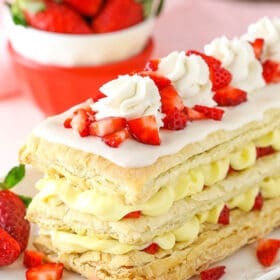 Too much gives you too thin of a frosting, and too little gives you too thick of a frosting. And peanut butter frosting is always the most tricky. 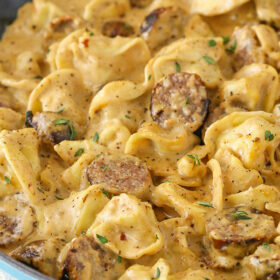 You’ll want to add a touch more liquid than you expect because the peanut butter tends to be drier. 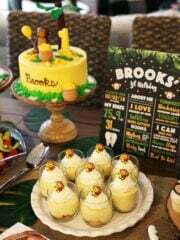 I used a large round icing tip to frost the cupcakes with their dome shape, meant to mimic the shape of the buckeye. To get the nice dome shape, you’ll hover the piping tip just over the center of the top of the cupcake and start piping the frosting. As the frosting spreads out to the edges of the cupcake, slowly lift the piping tip up, continuing to pipe the frosting with even pressure until you’ve created the dome. Once frosted, the cupcakes should be refrigerated for a few hours. The next step is to dip the frosting into some chocolate ganache and refrigerating it first will help make sure it stays in place on the cupcake when you turn it upside down for dipping. The final touch is to place the buckeye on top! You’ll want to make sure to do that while the ganache is still soft, so that they stick well. Such a cute and fun treat that’s perfect for an occasion, a party or even a football gathering (when it’s football season again, that is)! 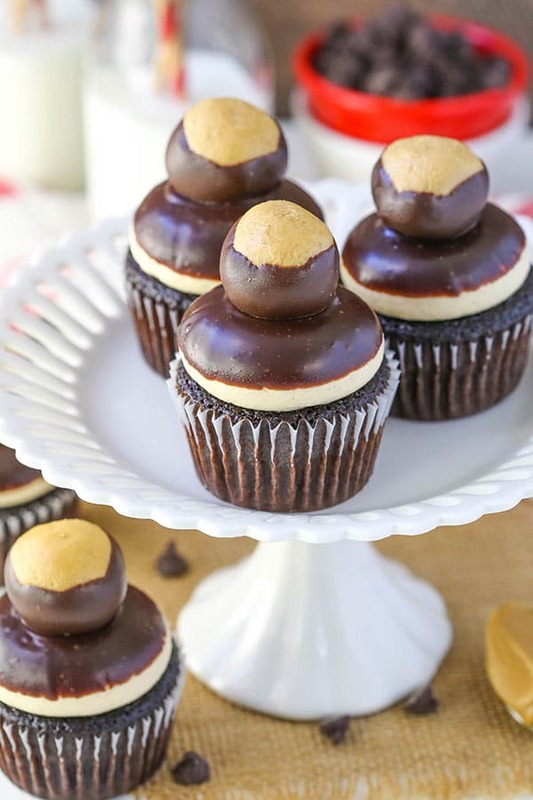 These Peanut Butter Chocolate Buckeye Cupcakes are made with a moist chocolate cupcake, peanut butter frosting and chocolate ganache – all topped with a cute little buckeye treat! 1. Combine the peanut butter, butter and vanilla extract with a mixer until combined. 2. Add 1 cup of the powdered sugar and mix until well combined. 3. 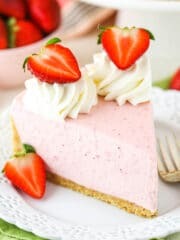 Add additional powdered sugar until the mixture is at the consistency where you can create a ball that will hold it’s shape and stay on a toothpick. 4. 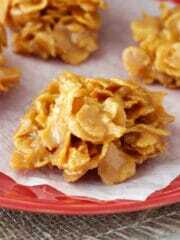 Create balls of about 1 tablespoon each. You should get about 16 balls. 5. Melt the chocolate according to package directions and dip each peanut butter ball into the chocolate using a toothpick. Set balls onto parchment paper to dry, then refrigerate. 6. Preheat oven to 300°F (148°C) and prepare a cupcake pan with liners. 8. Combine the egg, buttermilk, vegetable oil and vanilla in another medium sized bowl. 13. To make the frosting, beat the butter in a large mixer bowl and mix until smooth. 14. Add the peanut butter and mix until well combined. 15. Add about half of the powdered sugar and mix until well combined. 16. 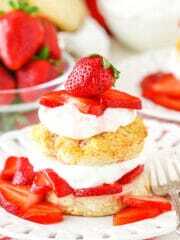 Add the vanilla extract, salt and 3 tablespoons of milk or water and mix until well combined. 17. Add the remaining powdered sugar and mix until well combined. 18. Add additional water or milk, as needed, to get the right consistency of frosting. 19. Pipe the frosting onto the cooled cupcakes. I used Ateco tip 808, a large round tip. Hold the tip slightly above the center of the cupcake, apply pressure to the piping bag and allow the frosting to spread from the center out to the edges of the cupcake, then slowly raise the piping bag and tip of create the dome. Release pressure and stop piping. 20. Refrigerate the frosted cupcakes for 2-3 hours, so that the frosting is firm. 21. To make the chocolate ganache, add the chocolate chips to a small bowl. 22. Heat the heavy whipping cream in the microwave until it just begins to boil, then pour over the chocolate chips. Allow to sit for 2-3 minutes, then whisk until smooth. 23. Dip the top of each frosted cupcake into the chocolate ganache and allow excess chocolate to drip off. 24. 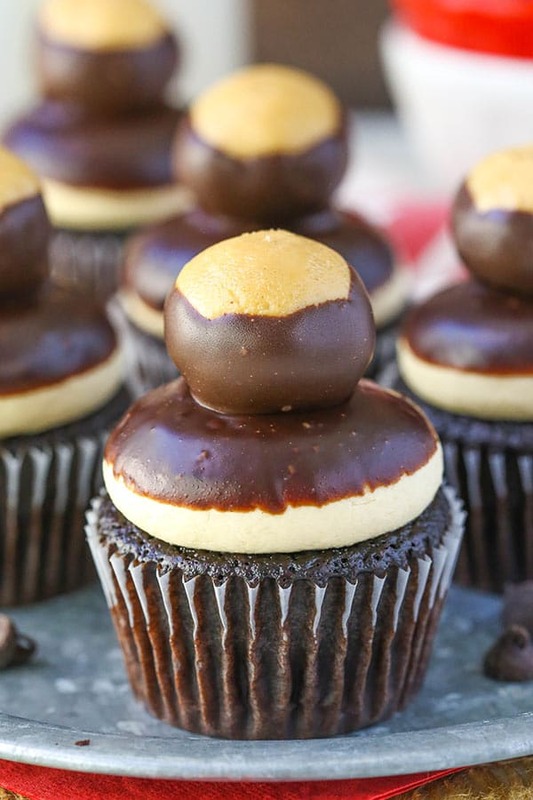 Place one of the buckeyes on top of each cupcake and allow the ganache to cool. 25. Refrigerate cupcakes in an air tight container until ready to serve. Serve at room temperature. Cupcakes are best for 3-4 days. Winning combination! 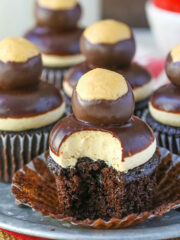 I love your peanut butter fudge brownies so I know these cupcakes will be just as marvelous. I can’t wait to try them! Thanks, Lindsay. Have you tried replacing the hot water whith espresso? You can definitely use coffee or espresso, if you like. Theae were a big hit at a Ohio State watch party fundraiser. I used “Cup for Cup” flour to make them Gluten Free! That’s awesome! I’m so glad you enjoyed the cupcakes! Ghirardelli baking chips for the topping should be ok, but they probably won’t firm up as well as the melting wafers. Not sure about the 100% cocoa in the cupcakes, but I think it’d be ok. I just JIF creamy pb and 2% milk. I always would recommend a higher fat milk, as you’ll get a better textured cupcake. 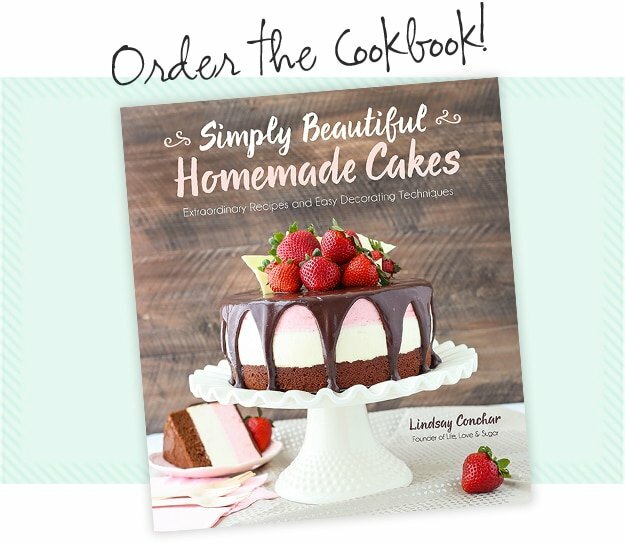 Hands down one of the best cupcakes recipes my husband and daughter loved it. That’s awesome! I’m glad you all enjoyed!